Desmond looks up from the life raft to see Penny standing at the bow of the rescue ship. 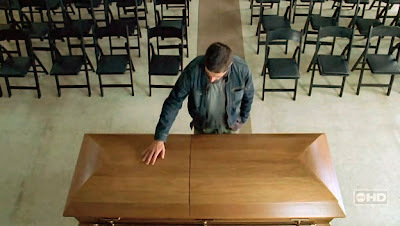 The camera pulls back to reveal that John Locke is in the coffin. I had absolutely no idea that Desmond and Penny would be reunited so soon. What a surprise! I will admit my eyes teared up at that scene. What a wonderful, happy moment. Especially after the scene where I was concerned they had killed off Desmond's character. It makes sense that Penny's boat would be near by (remember, she talked to Charlie in the Looking Glass, so she had to be nearby, tracking the anomalies that led her to the island). It also makes sense that she would help the survivors stage their elaborate lie. Does she know her dad (Widmore) is behind all this? Or is she just now uncovering the truth about her dad along with the losties? I was almost positive that Michael was going to be the one in the coffin. We waited all season to find out who it was and it turned out to be... Jeremy Bentham, i.e. John Locke. I'm just relieved they didn't leave us hanging until next season before they revealed it. Sun's heart-wrenching screams as she watches Jin on the boat disappear into an explosion. I can't believe they killed Jin. I feel like his plotline with Sun is somewhat unresolved, so I'm not sure how I feel yet about his death. What amazing acting on the part of the actress who plays Sun! I felt her horror and pain at seeing her husband die right before her eyes, just yards away from making it onto the helicopter. I'll admit, I cried at that scene too. That incident certainly makes Sun into a cold woman, bent on revenge... What's worse is that she is teaming up with Widmore - the bad guy! Ben: If you mean time-jumping bunnies, then, yes. There weren't too many funny moments tonight, but this line made me giggle. The Orchid orientation video Locke was watching (with the bunnies) finally confirmed for us, that space and time travel happens on the island. 1. What are the "bad things" that happen on the island after the Oceanic 6 have left? 2. Why and how did Locke end up in the coffin? 3. Is Claire dead? What's up with her and all the dead people visions the losties are having? 5. Will next season start out in the present (i.e. have we caught up to "modern day" or the time of the fast-forwards)? The first three short stories in the collection were knockouts. As a fan of all things horror (movies, books, etc. ), I smiled and sympathized along with the protagonist of the first story "Best New Horror". An editor of horror story anthologies, he bemoans the lack of any really scary or really original horror stories...until he finds it. The story then went from amusing, to absolutely terrifying, all while being self-referential to the horror genre. Loved it. Hill's writing is not as gory as some horror can be. Most of the stories were haunting, chilling and frightening, but at times also sad, sweet and even romantic. For example, "20th Century Ghosts" was a beautiful modern ghost story. While "Pop Art" was surreal yet touching and sad. I wish I could talk in detail about "Abraham's Boys" but I wouldn't dare ruin it for you. It is about a demented father, raising his two sons to continue his evil deeds. The question is, are they evil deeds, or are they, in fact, saving the world? What's nice is that the author leaves it up to the reader to decide. Another favorite of mine was "The Cape", an unexpected superhero story. For the horror genre, I found Hill's writing style to be more elegant and haunting than most other horror authors, which was a pleasant surprise and definitely to my tastes. All of his stories, event he ones that didn't particularly work for me, were very engaging. I will definitely be picking up Heart-Shaped Box and anything else he's written. As an aside, I appreciated the artistic detail of the book, with its soft velvet finish cover, shiny metallic film with ghostly image, to the rough-cut unfinished edges of the pages. It was nice to hold an artistic presentation worthy of the stories contained within. Also, as another aside, Joe Hill keeps an entertaining blog. 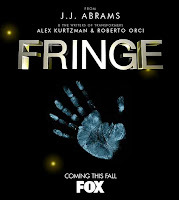 The link is listed to the right under the heading "Other blogs I visit..."
The show is called Fringe and is described on IMDB as "a television drama centered around a female FBI agent who is forced to work with an institutionalized scientist in order to rationalize a brewing storm of unexplained phenomena." Is this X-Files for the new generation? Or is this another slice of the secretive and paranormal Dharma world? My mind immediately jumped to that possibility when I saw Lance Reddick in the commercial. He is the actor who also plays the mysterious Matthew Abaddon on LOST. Then again, I've read that J.J. Abrams is loyal to the actors he enjoys working with and uses them in several projects, so maybe that's all it is. Either way, I have a feeling this is the show I will be watching while LOST is in its off-season. Take a look at the trailers below, as well as FOX's website for the show and let me know what you think. Sun (to her father): I just bought 50 percent shares of your company. Desmond: Sayid! Get down here right now! You need to see this! Take a moment and think back to Season 1 and how meek and repressed Sun was. How much she has changed! I never imagined I'd see her standing up to her dad like she did in the flashforward. I think it's interesting that each one of the Oceanic Six is dealing with their grief in their own way. Sun is taking the revenge route. Hurley is taking the paranoia route. Jack takes the substance abuse to drown his pain route. What was even more shocking though, was Desmond finding the ginormous pile of plastic explosives in the hull of the freighter. That discovery led to a whole host of questions: does Jin (who is on the freighter) really die? If the freighter gets blown up, how does Sun and Aaron (who are currently on the freighter survive? Are they going to kill Desmond? (They'd better not!) How do the other Oceanic Six manage to get back to civilization if the freighter is blown up? I hope the freighter gets transported with the island when they "move" it, because it is so close. I'm hoping that, mainly because I don't want Desmond to die. The Oceanic Six step out of the cargo jet, to see that their families are waiting for them. Hurley runs to his family. Jack kisses his mom. But Sayid and Kate hang back. No one is there waiting for them. I actually thought all of the flashforward scenes were tragic and touching. I loved it how Hurley is always thinking of others, and is compassionate to them. Did you see how he pulled Sayid over and introduced him to his family and his mom gave him a big hug? I cried when Sayid and Nadia were reunited later. What a bittersweet homecoming, and what great acting on the part of the actors portraying the Oceanic 6, you could see the conflict on all their faces. You could also see how they were trying to fit back into society, but that things will never be the same. They can never go back to normal again. What I want to know is, did they come up with the lie themselves, about what really happened after the crash, in order to protect the survivors they left behind? Or is someone forcing them to lie? Hurley's Mom: Jesus Christ is not a weapon! Hurley (to the reporter): Dude, was that directed at me? Hurley: Yeah...my mom just...doesn't...get it. Once again, the funniest lines of the night go to Hurley and his mom. 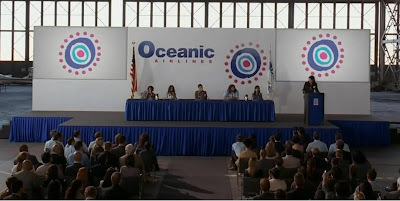 Concerning the press conference, I appreciated it that the writers on the show didn't shy away from the obvious questions about the Oceanic Six, such as Kate's supposed pregnancy, and the fact they all look healthy, for people who supposedly survived on an island for several months. This episode was a great set-up for the season finale, although I'm already dreading the long wait until the next season. The group is so splintered - from the beach to the jungle to the freighter to the Orchid station - how are they all going to re-join in order for the six to be saved? What did you think? What are your most outstanding questions? Do you think the flashforwards are the actual future or a potential future? What did you think of yet another Wizard of Oz reference (in the title of the show)? I invite you to share your thoughts and theories in the comments section. I just returned from a trip to the Land of Oz to visit some relatives out in the country. I enjoy traveling, visiting friends and relatives, and seeing new places, but I must say, "there's no place like home." To use another idiom, "absence makes the heart grow fonder." I was so happy when the plane touched down on desert ground and the doors opened up to bright Arizona sun. 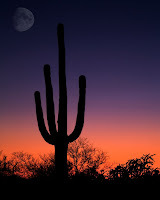 My time in Kansas inspired the following list of things I love about Arizona. Consider it a completely biased "ode" to my hometown. 1. BUT IT'S A DRY HEAT! Everyone always wants to know how Phoenicians deal with the 100 degree plus weather. All I know is I'd rather have a 115 degree dry heat day than an 85 degree day with 60 percent humidity. I have discovered I have no tolerance for humidity. Neither does my hair. 2. NATURAL DISASTER? WHAT'S THAT? Thankfully I didn't have to dodge any tornadoes during my stay in Kansas, but there were several in the surrounding areas. As I was contemplating how quickly I could evacuate to the storm shelter (13.5 seconds, if you care to know), I realized that Arizona doesn't suffer from natural disasters. No earthquakes, tornadoes, hurricanes or flooded rivers. Nice. 3. RUNNING A QUICK ERRAND DOESN'T REQUIRE SEVERAL HOURS AND YOU PACKING A SACK LUNCH. Granted, my extended family lives in a rural area, but it seemed like to me quite a bit of Kansas is made up of small towns separated by vast expanses of wheat fields. The nearest pharmacy, dentist, Wal-mart or any other necessities or conveniences were an hour's drive away. That means two hours total. I didn't realize how spoiled I was for living in Phoenix, with everything so close by. 4. OUR STREETS ARE SQUARE. Phoenix and the surrounding cities are laid out on a grid. All our streets are square and parallel and logical and sane. They don't meander or dead end or diverge and intersect at random places. Have I mentioned I feel spoiled to be living in Phoenix? 5. NO ONE TO BUG YOU. I'll admit it; I was born a city girl and I'm a city girl at heart. I don't like bugs. I know Arizona has scorpions and all kinds of bugs, but in the big city the most you ever see is the occasional spider. Rural Kansas is full of bugs. The worst for me is the dreaded mosquito. I must smell like the best smorgasborg ever to them, because they LOVE to bite me. In Arizona, I don't have to worry about taking a shower in insect repellent before leaving the house. 6. HOME IS WHERE THE HEART IS. I'm not naive. I know Arizona has it's own problems and downfalls. I also don't believe that city living is in any way superior to the rural country life that some of my family chooses to live. It definitely has its own charms and appeal. All I know is that home is where your heart is, and my heart is in the Valley of the Sun, where I've made my life with my dear husband. It's where my church family and my friends are, and I wouldn't want to be anywhere else! This desert rose is glad to be home! No place or city is perfect, but it may be perfect for you. What's your favorite thing about your hometown? Leave me a comment and let me know. Richard Alpert stands silently outside the hospital room door, looking in on preemie Locke. Locke: "We need to move the island." It had been so long since we'd seen Richard, that he was the last person I was expecting to pop up in that flashback scene. Why, oh why, does Richard look exactly the same in the 50s, the 70s and today? I really really want to know! Is he time jumping or is he an immortal or what? But, even more shocking was the last line of the show- that in order to save the island, they must move it. So, my question is this - does the island even exist in our reality? Is it on a different time plane? A parallel dimension? What? How are they going to move it? I need answers! Ben and Hurley silently share an Apollo candy bar. Okay, so there really wasn't a "heartbreaking" moment in this episode. I thought the scene with Hurley reluctantly deciding to share his candy bar with Ben was kind of funny and sweet. Hurley is such a sweet soul, willing to just go with it, and forgive even the most awful of people. I think he also recognized the utter defeat Ben was experiencing. He's a broken man. Ben to Locke: "Fate is a fickle b***h."
Again, a really funny line didn't stand out for me in this episode, but I thought this line from Ben was a real zinger. It was nice to see the discussion of fate and destiny come back up again. It used to be such a prevalent theme of the show, especially in the first season. It seems the island keeps some type of balance. Is it fate or karma? Do any of the losties have any control over their destinies? I can't believe the season is almost over. There's so much left to find out! I can hardly stand the wait until next week! What did you think? I invite you to share your thoughts and theories in the comments section. There's so much more to talk about than the things I listed here! I just realized I never wrote a review on Lisey's Story by Stephen King, which I read a few months ago. 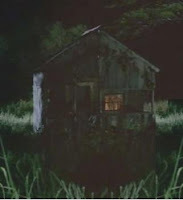 It was unlike any other Stephen King novel I've read, in that it was a tragic love story. Most of his other novels do contain a romantic sub-plot or have love as a theme. However, this was a straight-out love story. The twist is that one member of the romantic couple is dead. The main character, Lisey, has been a widow for two years. As the story follows her through her continued grieving process, strange things start happening. (Of course strange things start happening, I mean, it is a Stephen King book after all.) Her husband was a famous author and as she goes through his archives of work she learns more about the imaginary place he went to get his stories, in the land of Boo'ya Moon. As she delves further into his world of writing, and relieves memories of their life together, she learns more about the man she loves and also learns how to let him go. I actually found this novel a little hard to read. King uses some strange turns of phrase that would always trip me up whenever I came across them. They didn't make sense, even after an explanation. Not only that, but he repeated them constantly. I found it distracting. (In the Afterword, King explains these phrases were lifted from the works of some of his favorite, and famous, authors' works, in a type of homage to them and their influence in his writing. That's nice, but I don't think it worked.) The story was interesting and engaging, but I also had a hard time sympathizing with the main character, or truly feeling her loss and her love. I can't really put my finger on why, either. All in all, it was an interesting exercise from King, but it's definitely not one of my favorites. I think he has told more compelling powerful love stories in The Stand, The Dark Tower series, and others. The other book that I have read recently is a non-fiction work called It's All Too Much by Peter Walsh. If you've seen Clean Sweep on the TLC channel, then you've seen Peter in action. He is a professional organizer and with this book, he takes you step by step through the process of de-cluttering your house, getting it organized and then he gives tips and instructions on what to do to keep it from getting cluttered up all over again. The tone is personable, refreshing and often times humorous which helps the reader to learn and remember the principles being discussed. Illustrations from real life situations and testimonies families Walsh has helped were also a nice touch. I was very pleased with this book. Before I started reading it, I was worried it would contain a series of useless suggestions like "Buy color-coordinated storage bins." or "Use a label maker." Quite the opposite, the book gets to the heart of the matter first, addressing the emotional and practical issues behind clutter and junk, such as the emotional ties to family heirlooms, our materialistic society and its influence on us to "buy more stuff", etc. Walsh recognizes that it's pointless to begin cleaning up your clutter until you address the behaviors and situations that led to that state, and commit to changing them. I am a "collector" and also cling to emotional mementos. Combine that with two major deaths in my family (guilt and reluctance to get rid of stuff associated with them) and my mother moving out of her home of 30 years (my childhood home) and I have accumulated junk up to my eyeballs. So I found this book to be an invaluable resource, and have already began working through his plan. Perhaps I will give you an update later, when I have followed all his steps. I highly recommend it for both the hopeless hoarder and the person who just may have one junk room, or a garage filled with boxes instead of the family car.